This place had a refurb a few months ago and has changed hands in the last couple of weeks. Out - ultra loud music and very late night opening to try and join the Ashley Cross circuit. In - much cleaner, slightly more food orientated and a customer friendly landlord. I went in on Sunday lunchtime as he was pulling through two lines, he'd never seen me before but immediately offered to get a pint from the cellar. Normal Badger beer but in good nick. The pub has now just changed management and we are hopeful that things will start to improve. Lets hope so! The first thing to go should be the smell of the drains. No obnoxious music or giant TVs, just a warm quiet friendly atmosphere. Beautiful ale, if a bit on the expensive side, though apparently the lager is worse. Very nice retreat from all the millions of weatherspoons. 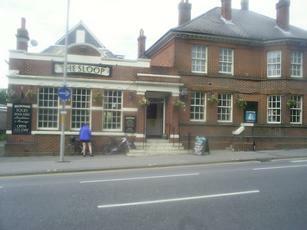 Despite being next to a main road and very near to the college, this pub is never very busy. The standard of service is variable. The landlord is friendly enough, but the whole thing is let down by some of the female barstaff employed there. I think these girls are the ones who work in department stores during the day, you know the ones who stand behind a till chattering to themselves leaving you waiting to be served? I was last in the pub on Friday 02 Feb 2007, and I am in no rush to go back.